Here are all of the mini sessions for the Fall! Share on Facebook and through e-mail, if someone books as a referral from YOU, then you get an additional image for FREE! SOLD OUT! Contact me to get on the waiting list! 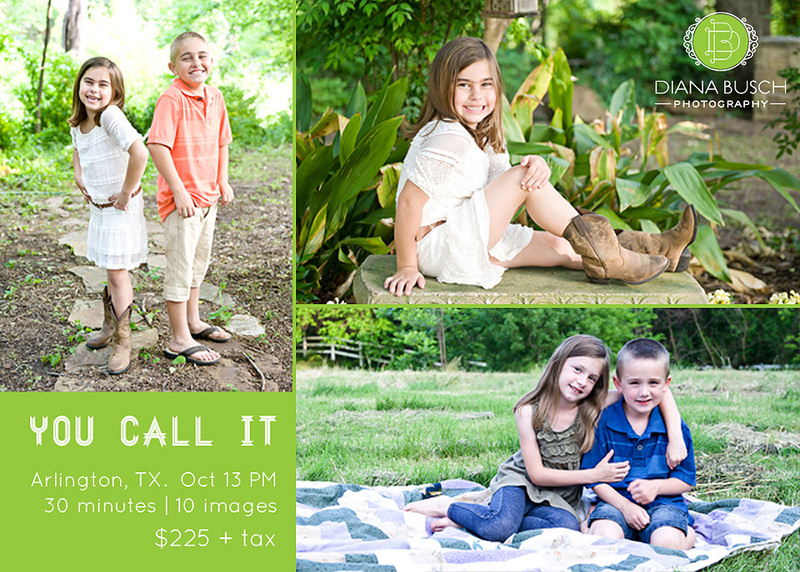 This mini session is available for families, kids, couples, etc. Cost is $225 plus tax for up to 6 people in the session, any additional is $25 per person. The location is in Arlington and it is BEAUTIFUL! We will be the only ones on the property, so we will not have to fight for a location with other people/photographers. So many possibilities here! $100 deposit is due to reserve your time slot, the remaining $143.56 is due at the session. The times available are in the afternoon and evening on Sunday, Oct. 13th, once you have paid the deposit and all times are filled I will send e-mails in order of when you paid to pick your spot. Right now the times are between 4:30 and 6:30 but will possibly open more times if there is a need. I am debating on opening up another mini in Dallas if this one fills up, this will be indoors at an all white studio in November. If you are looking for something more like this, please let me know. If there is enough need I will schedule another mini session day. Pay your deposit by clicking the link below or contact me to pay by cash or check. This mini session is available for kids only. 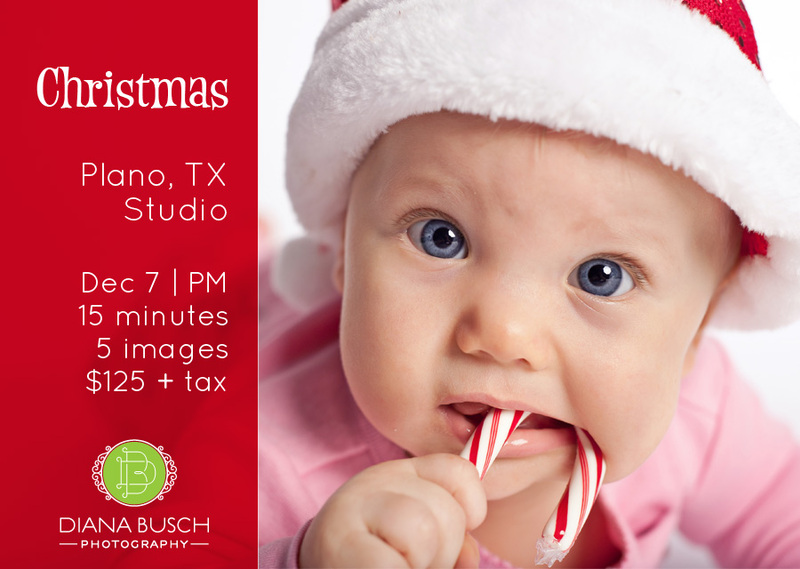 Cost is $125 plus tax for up to 2 kids in the session, any additional is $25 per child. The location will be in Plano. I decided to do something a little different this year. Instead of going to the Arboretum, I am going to design a set. It is SUPER cute! $75 deposit is due to reserve your time slot, the remaining $60.31 is due at the session. The times available are in the evening of Saturday, Oct. 26th, once you have paid the deposit you can choose your time. Times will be between 4 and 6 p.m. If there is bad weather, the set will be moved in Studio. 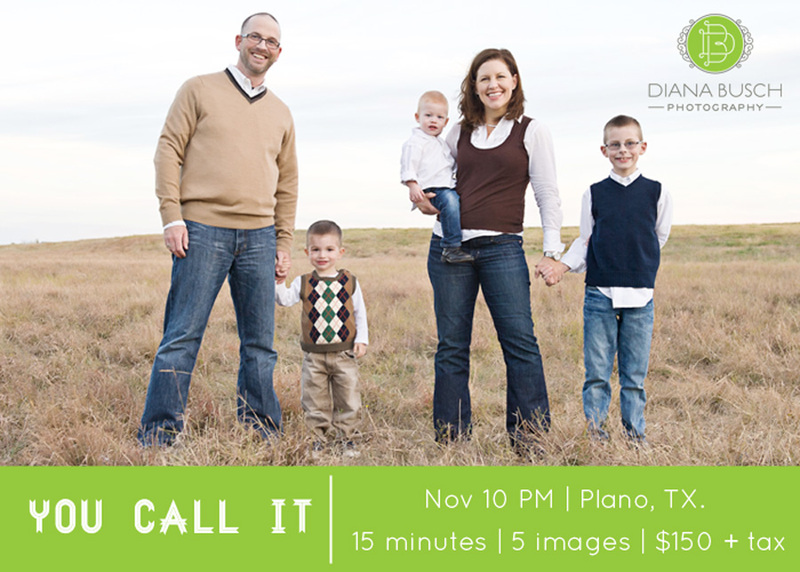 This mini session is available for families, kids, couples, etc. Cost is $150 plus tax for up to 6 people in the session, any additional is $25 per person. The location is in Plano and will be in a field, there will be some variety of posing but we will not change locations. $75 deposit is due to reserve your time slot, the remaining $87.38 is due at the session. The times available are in the afternoon and evening on Sunday, Nov. 10th, once you have paid the deposit and all times are filled I will send e-mails in order of when you paid to pick your spot. Right now the times are between 4:30 and 6:30 but will possibly open more times if there is a need. This mini session is available for kids only. 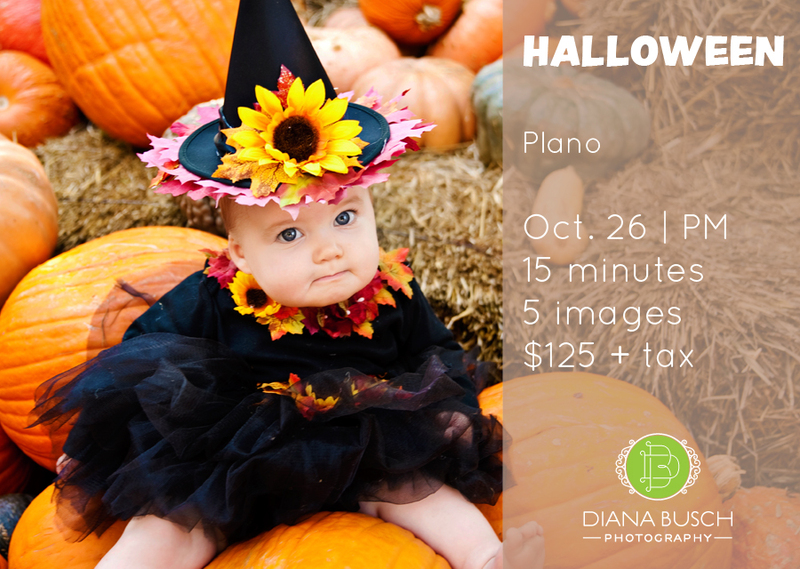 Cost is $125 plus tax for up to 2 kids in the session, any additional is $25 per child. The location is at a studio in Plano. The times available are in the morning Saturday, Dec. 7th, once you have paid the deposit and all times are filled I will send e-mails in order of when you paid to pick your spot. These times are between 9 and 11 a.m.